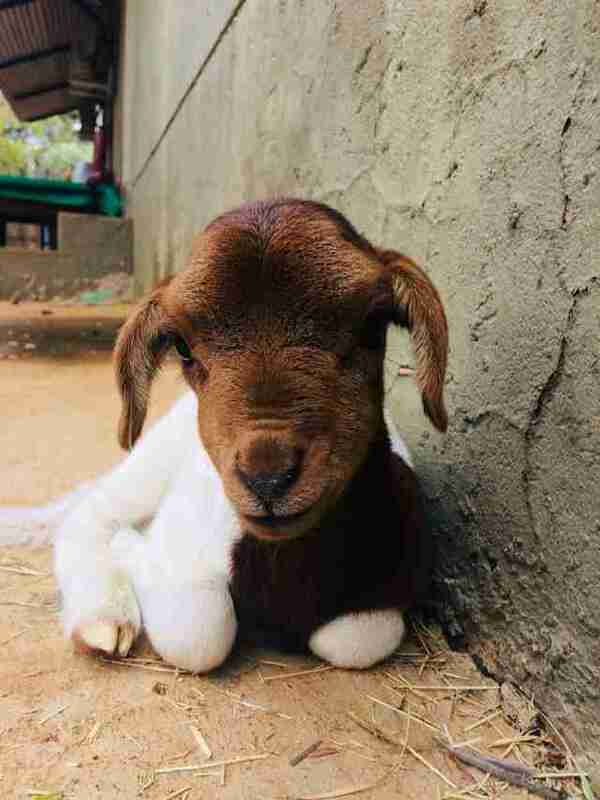 He didn't have anyone in the world — until he met this little lamb. 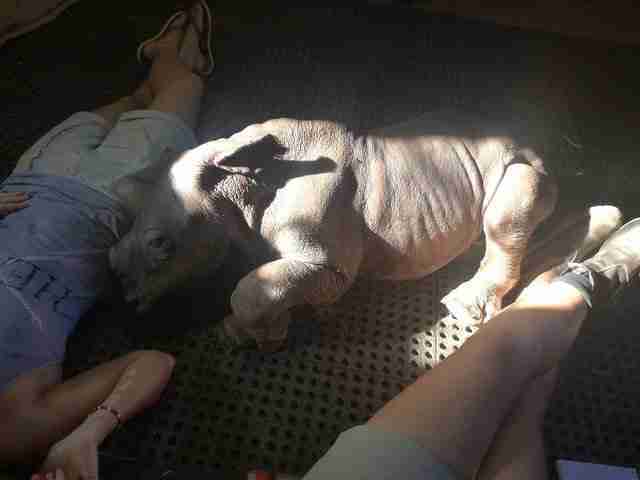 When a tiny rhino first arrived at The Rhino Orphanage in South Africa, he was the tiniest rhino patient there. At just over 10 days old, he'd already been through enough trauma for a lifetime. 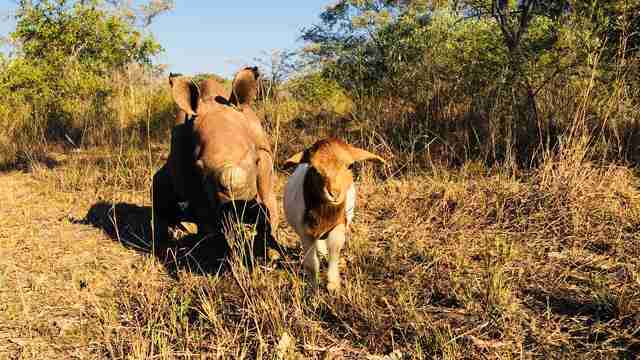 The rhino, who was named Marang, which means "ray of sunshine," had been found beside his mom's body in April after she'd been killed by poachers. 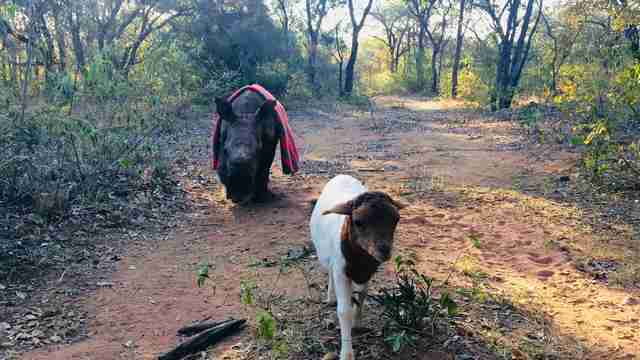 His rescuers — who are trying to save rhinos from extinction by raising orphaned calves into strong and healthy adults — had the sad task of washing Marang's mother's blood off of him. And while Marang has dedicated caretakers who keep watch on him day and night, the people at the orphanage know how important it is for young orphans to socialize with other animals, not just bond human beings. But because he's so small, becoming friends with another of his kind was complicated. 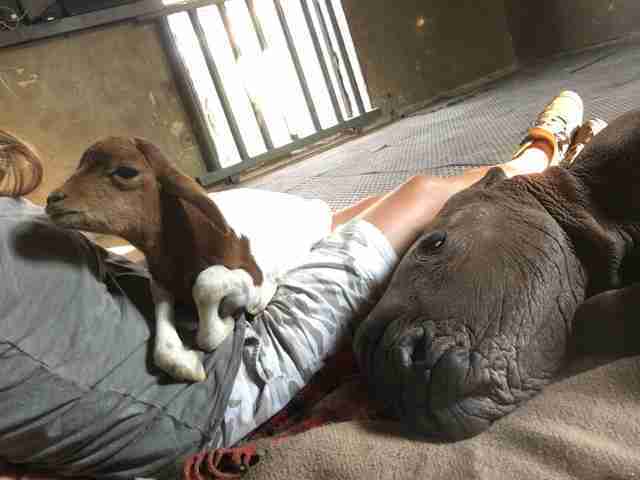 "Because he is so much smaller than the other young rhinos at the orphanage, we are not able to pair him up with another rhino," Yolande, a caretaker for Marang at the orphanage, told The Dodo. 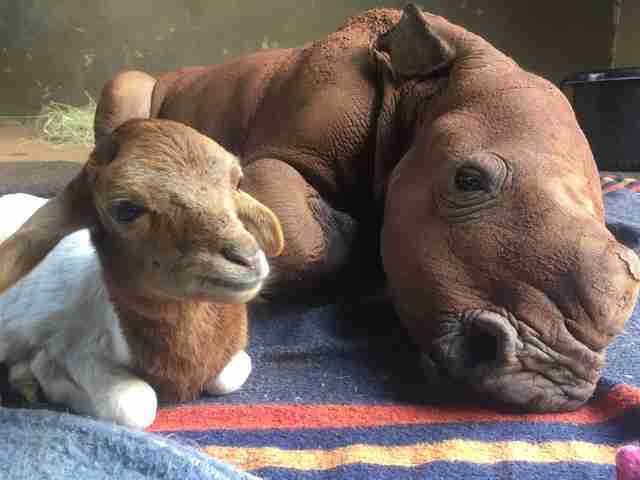 So when a young little lamb named Elsa showed an interest in the tiniest rhino at the sanctuary, the people who care for Marang were overjoyed that there seemed to be a real connection. "Elsa started wandering into Marang's room," Yolande said. "Soon we realized that he likes this strange tan and white creature." Elsa was drawn to little Marang, and perhaps it was because she could sense he'd been through a hard time — and she'd been through a similar loss just a few months before, when she was just about 4 or 5 days old. Elsa had been living on a farm with her family in a larger herd when the whole herd had to be transferred to another piece of land, since there was no more grazing left on the farm where she was born. 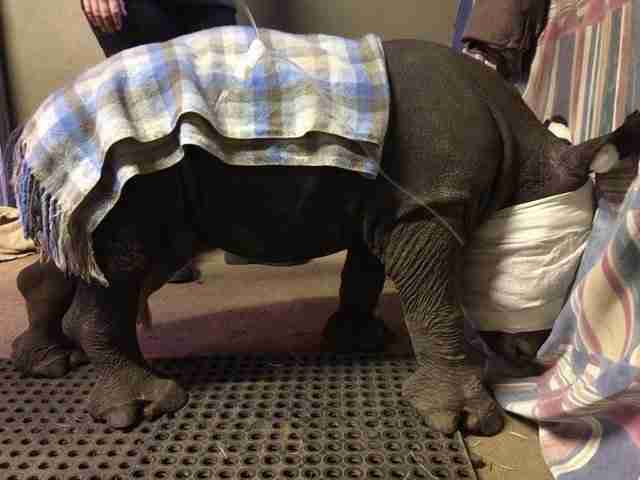 During the transport, Elsa became separated from her mom and left behind. 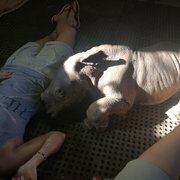 The veterinarian who treats the animals at The Rhino Orphanage brought Elsa there, where she knew she'd have a good home. 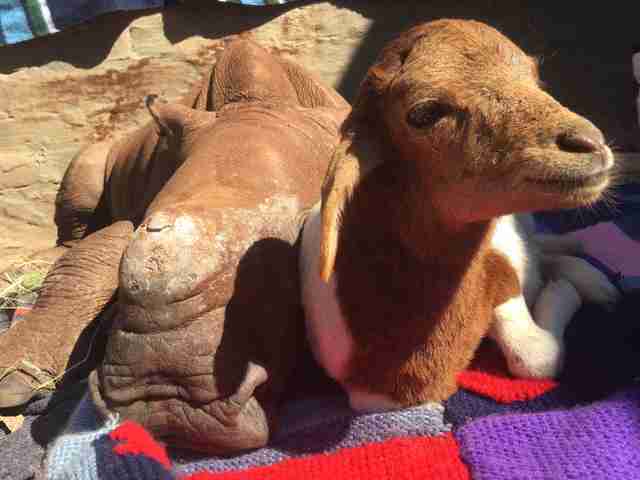 "Elsa was a tiny little lamb no bigger than a 2-liter soda bottle," Yolande remembered. But in those early days, there were some doubts about whether Elsa was strong enough to make it. "There was something not quite right with Elsa," Yolande said. 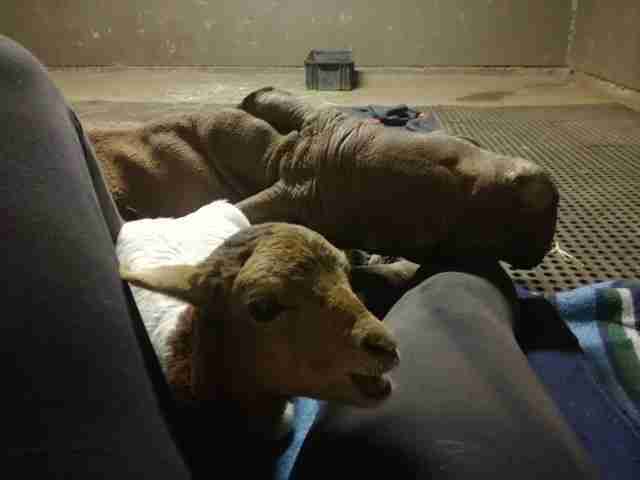 "She would bloat severely after a bottle feed. We tried different milk formulas and concentrations, electrolytes and medication, but nothing helped. We had to manage her very carefully as the bloat, if too severe, could kill her and also caused discomfort and even pain." But no one gave up on Elsa — and she could probably feel the love and concern people had for her. "We altered her feeds, fed her with the head and shoulders elevated to help with release of air, and gave her smoothies," Yolande said. Finally, Elsa started getting stronger. "We are now at a point where Elsa is fully weaned and actually picking up weight." The little lamb even became strong enough to be a friend. As Marang was spending his first few weeks resting in his room, Elsa just kept wandering in and lying down with him. Then Marang showed he was strong enough to begin going outside — and out Elsa came too. They enjoyed soaking in the warm sunrays on a blanket together. Then Marang showed some interest in exploring the grounds — and it seemed he was also strong enough for this — so naturally Elsa came along. 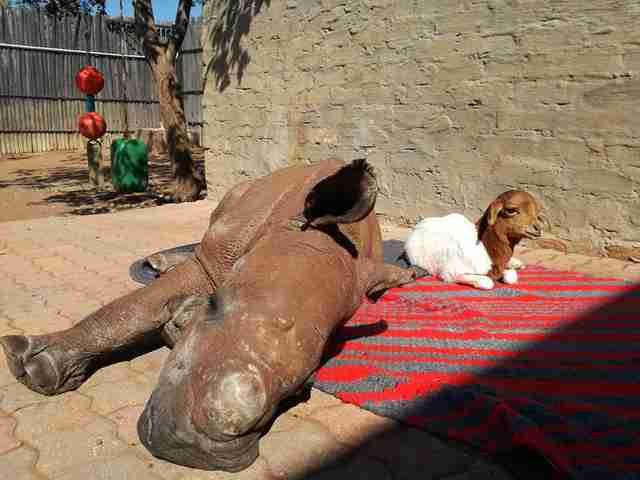 "She and Marang have found something in common: their love of sleeping in the sun," the orphanage wrote on Facebook. "Elsa spends her time with him whenever possible so that they can bond." The pair now spend their days together, happily grazing in the fields. Even though Marang is far larger than little Elsa, he still tends to let her lead — after all, she is his elder. 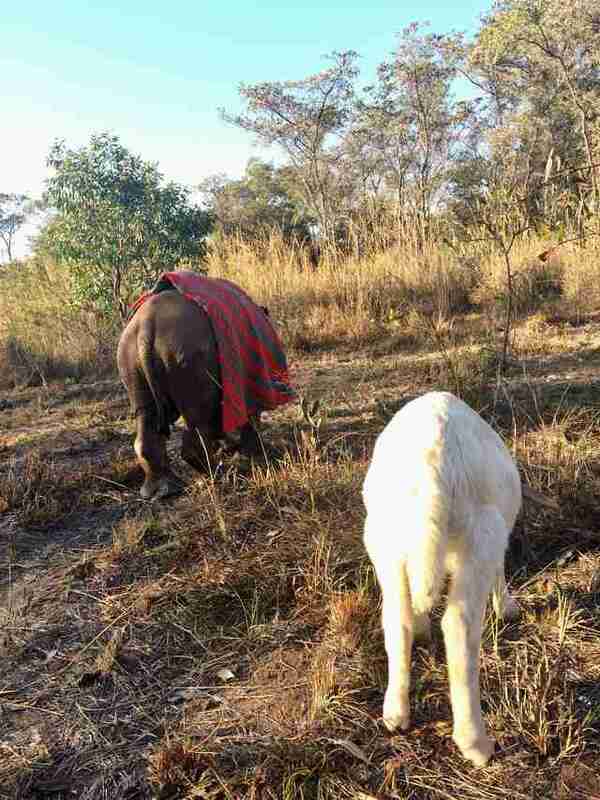 Ideally, Marang and Elsa would be able to spend every moment together during the night, too, but Elsa has a particular and rather sheepish habit that Marang still isn't used to. "They still can't quite sleep together," Yolande said. "Elsa's sudden bleats at night frighten Marang and make him jumpy." "Hopefully soon he'll be accustomed to [the sudden bleats]," Yolande added. "It is always better for orphans to have animal friends." You can help Marang and his best friend Elsa keep growing up strong by making a donation to the orphanage.